Okay, so we're in the midst here of what we're all hoping is the last gasp of winter, but the temperatures plummeted last night and it was 9 on the Fahrenheit scale when I got up this morning. Yep, that's ice. Note the proximity of the dock piling to the boat. I thought, while it was on my mind, that I'd pass along a bit of what we've learned about living with ice on the river. First of all, as alarming as the movement of ice along the hull--the barrels in our case--can sound, this startling cccccrrrrrruuuuuuuunnnnnnnnnnccccchhhhhhhhhh in the middle of the night, with the exception of slight damage to ablative bottom paints (which are, after all, designed to be a bit soft), the ice probably won't hurt your boat. Barrel barges are apparently especially immune as the shape tends to allow them to be pushed to the surface by encroaching ice, leaving them sitting high and dry. Damage, other than running into the stuff at speed, tends to be done when the boat becomes ice-locked with the ice pressing in from all sides and giving the vessel no where to go. Straight sided displacement hulls are more vulnerable in those instances. Bubblers and Ice-Eaters can help here by cutting spaces in the ice, giving it room to expand and keeping it away from the docks and boat hulls. One of the thing that we didn't think about was the effect being ice locked might have on getting on and off the boat. See the above picture? 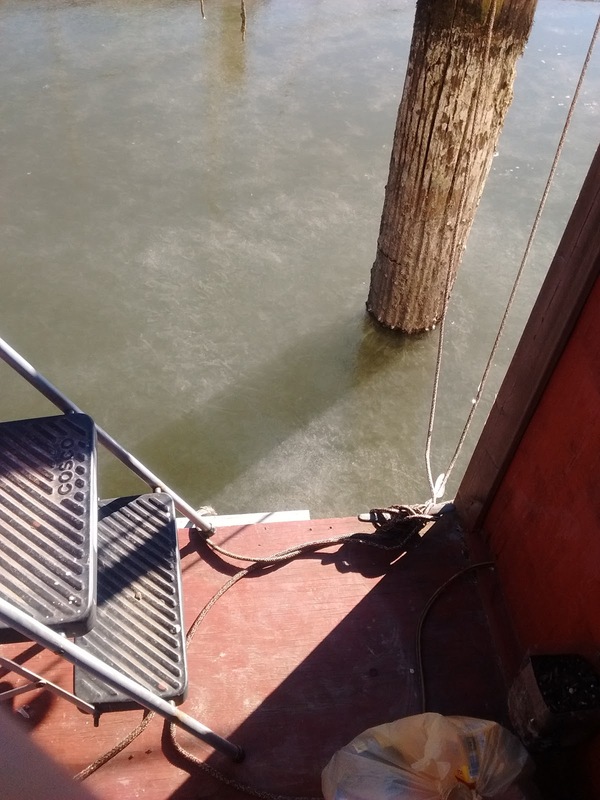 That's about three feet between the dock and the boat, and because of the ice, we can't pull the boat over to step off. After all, it's COLD out there. . . .
oh, hey, new stuff over at Life, Art, Water. Check it out! Okay, so what kind of changes. . . .